There have been some considerable revisions to the 2013 Audi R8 sports car, which also include a more powerful engine. The new V10 plus uses the same 5.2 liter engine that is housed in other R8, but in this case it has been enhanced to produce a maximum of 542 bhp. With inclusion of new S-tronic semi-automatic transmission system, it can boost from 0-62 mph in just 3.6 seconds. Although for its top speed i.e. 196 mph, you will need to stick with the manual gearbox itself. The V10 plus is available only in the coupe version and is fitted in the standard with the carbon-fiber ceramic disc brakes which are available with some extra cost in other versions. The new S Tronic transmission is a seven-speed semi-automatic transmission unit that replaces the previous R tronic six-speed transmission. The S-tronic provides enough acceleration to get the car to a whopping 0 to 62 mph in just 3.6 seconds other than adding another 2900 pounds to the car’s price. The new transmission also improves the combined fuel economy and can reduce carbon emission up to 22g/km depending upon the version and model. Audi R8 has also witnessed several style changes and all 2013 cars have LED headlamps as standard equipment. 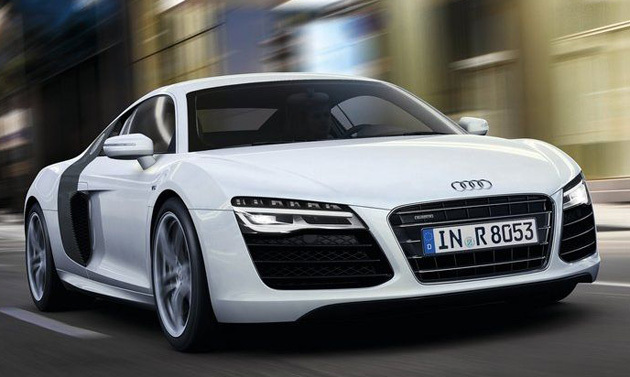 The new 2013 Audi R8 is priced from 91,575 pounds or 124,675 pounds in case of V10 plus engine. The car will be available to order from August, with the deliveries scheduled to start next year.